Summary: Sami, about six or seven years old, tells this story. His is one of the families that must leave their homes because of bombing and warfare. As they trek across the country Sami can only think of his birds, the pigeons that he fed on his rooftop. Did they escape the bombing? Sami and his family reach a refugee camp and begin to establish life again: Father plants a garden; Mother cooks; children go to school and play games. But Sami thinks of his pigeons and can only paint dark, black pictures. He tries to forget the smoke and bombs by looking at the clouds and sky. One day, some birds appear, not Sami’s birds, but birds that Sami can care for and that can care for Sami. Now there are good days. As refugee families continue to arrive, Sami sees a new girl his age who is crying for her home. He approaches her with a smile and a bird in his hand. How does the perspective on gender/race/culture/economics/ability make a difference to the story? The location is Syria; these factors play little part in the story. Literary elements at work in the story. The voice of a child telling this story makes a distant tragedy real without details that would overwhelm the reader. Del Rizzo illustrates the story vividly with polymer clay models and acrylic paint. The sky, important in Sami’s recovery, is especially dramatic and the details on the birds are stunning. 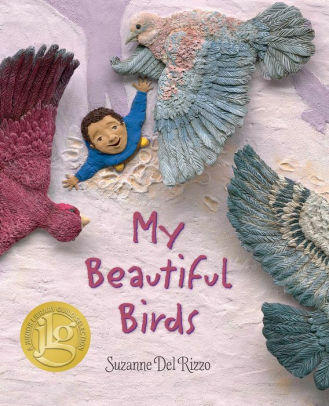 An article about a boy in a refugee camp finding solace in birds suggested this book to the author. She has a final note about refugees in the world today and where to find more information. Theological Conversation Partners: “Where Will Jesus Spend Christmas?” headed a newspaper article last December. There followed a description of a Syrian refugee camp. Surely the residents of these camps (65 million refugees worldwide) qualify as “the least of these.” We do well, then, to help children know about these people and Birds is an age-appropriate introduction. There is sorrow here but also hope. God’s creation-sky, clouds, birds-plays a part in Sami’s healing and helps him reach out to another grieving child. Sami’s desire to share his joy in a bird is the most hopeful note in the book. There is nothing here to indicate that God is present or concerned. Sami asks the sky to protect his birds. This could be the start of a conversation. Is God present and at work even when God is not recognized? It is important when introducing children to such a painful problem to offer them some means to address it. Most churches have some avenue for ministering to refugees. Packing kits of school supplies and other necessities is one way to help children recognize that God can work through them in such tragedy. Sami and his family and neighbors are refugees. Talk about what refugee means and how many there are in the world today. Perhaps your church has welcomed a refugee. Find Syria on a map. What does a refugee camp look like? What worries Sami most about leaving home? Imagine what it would be like to leave home and not know what happened to your pet. What helps Sami think about his grief? How do the new, different birds help Sami? How does he help a new refugee? This book review was written by frequent contributor and Union Presbyterian Seminary alumna Virginia Thomas. My Beautiful Birds by Storypath is licensed under a Creative Commons Attribution-NonCommercial 4.0 International License.